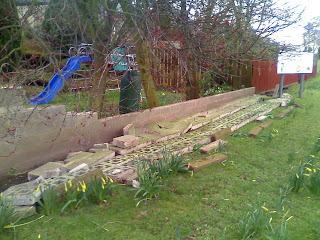 Ian Gent's Blog: This is an ex wall. This is an ex wall. This wall has ceased to be. This is what we saw on Wednesday morning. We kind of like having the ability to step out onto the riverbank. But it's hard work getting all the bricks out of the way. Luckily we have a tip about 200 yards away and a neighbour with a wheelbarrow. The blocks with holes are serving a new role as stepping stones in the garden. I dig them in so their ugly concreteness is not visible, then they are great for stepping on. Either you can get from a to b, or you can do a bit of weeding or planting without stepping on plants. Things can grow through them too because of the holes and they won't affect drainage. Of course weeds might come through them, but they are not concreted in so in the worst case, pull it up, weed, repeat. 25 Random Facts about me. How To Become Prime Minister?